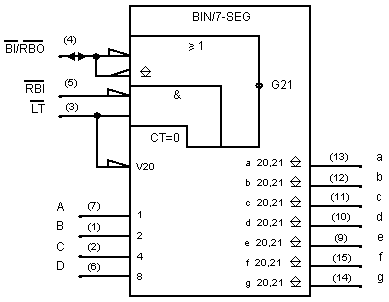 For one of the projects I have on my workbench I was using a BCD-to-7-segment decoder in form of a 74LS247N. While I was looking for some more detailed specifics about this circuit I got the impression that – although it’s a quite common and a more or less trivial one – not very much about it could be found on the internet (or maybe I was just not able to find it). So here here we go. During my journey I stumbled upon a very useful tool that I used to document the circuit: logisim. It is also very helpful when you’re about to design logic circuits. You just need to provide the in- and output by filling the state table and the program generates a gate based representation. BI is active low i.e. when put on low level all segments will be off regardless of the input value. The seconds function of this pin is to provide a low level if inputs A-D and RBI are at low level while LT is at high level. If this pin and inputs A-D are at low level while LT is at high level all segments are off. If the other two are inactive (i.e. at high level) a low level at this input results in a high level on all outputs. I.e. all segments are on. As you can see the inputs are identical to the 74247 and the differences are on the output signals. The design files which can be opened in logisim can be found on GitHub.